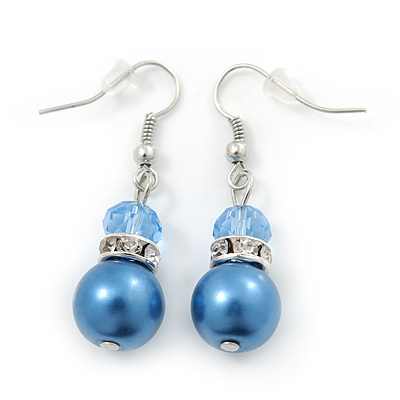 Update your look with these classic Violet Blue Simulated Glass Pearl, Crystal Drop Earrings In Rhodium Plating. Featuring a simple drop design, made of 2 graduated violet blue and cornflower blue glass beads. The large bead is about 12mm in Diameter. The beads separated with a single crystal ring, for a dash of sparkle.